People matter to God. Even the youngest. Especially the youngest. When his disciples were preventing infants from coming to him, Jesus rebuked his friends in favour of children. Jesus said we all have to be like children – completely dependent, bringing nothing – if we are to be part of His kingdom (Luke 18v15-17). Not only do the young matter to God, they can be Christ’s followers. As a church, we are committed to valuing children like God does. It means all our leaders are skilled (for quality teaching) and safe ministry trained (for every child’s protection). We run a variety of ministries to children & youth on-site, as well as involvement in schools with SRE. Who? 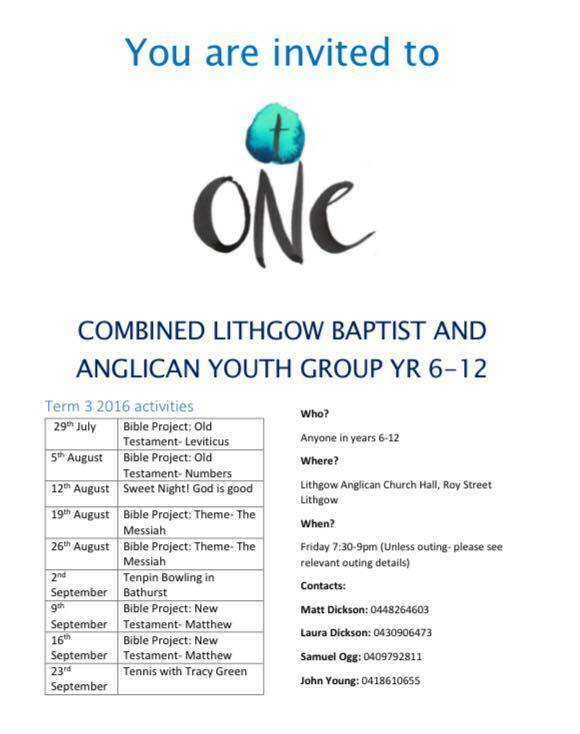 For young people in Years 6 to 12. When & Where? Friday nights (during school term) from 7.00 pm - 9.00 pm alternating between St. Paul's Lithgow hall and Lithgow Baptist Church. Who? All in Years K-6 are welcome. When & Where? Fridays 5:00 pm - 6:30 pm (during school term). Commencing Friday 3rd August 2018. Church hall, St Paul's Anglican, Roy Street, Lithgow. What? Fun, friends, games, music, craft, & adventure as we learn about Jesus. Who? RED is our Sunday program for high school students. When & Where? RED runs Sundays (throughout school terms) at our 10AM service at St. Paul's Lithgow. What? A small discipleship discussion group. Who? 'Kids For Jesus' is our Sunday children's program for Preschoolers - Year 2 students. There is a creche for children younger than preschool age at our 10AM service. When & Where? KFJs runs throughout school terms at our 10AM service. What? Singing, dancing, craft, games and fun as we learn about Jesus using the Gospel Project for Kids & Preschoolers. Who? 'TIC TACs is our Sunday children's program for Year 3 - Year 6 students. When & Where? TIC TACs runs throughout school terms at our 10AM service. What? Games and fun as we learn about Jesus and living life for Him. Who? Kids of all ages. When & Where? Runs throughout school terms at our 3PM service in Portland.